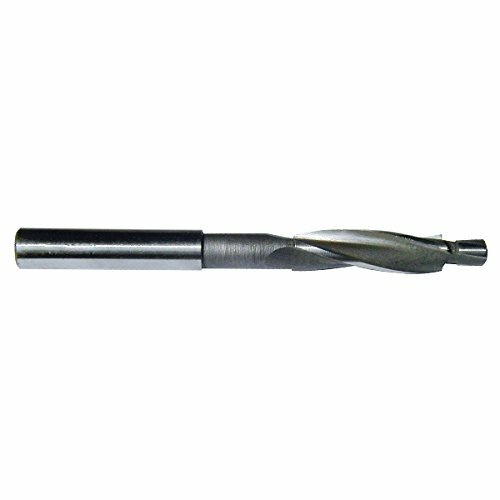 Minimum Cut Diameter: .156 Because there is a pilot hole the tool will not cut below this diameter. Continuous pilot counterbores cut rapidly, smoothly and accurately, producing long spiraling chips rather than small metal particles The pilot extends the full Length of the flute portion of the tool As cutter flutes are Ground back due to wear, a new section of pilot becomes exposed The pilot head may be cut off to any desired Length when repeated sharpening make it too long for practical use Continuous pilot counterbores have a life many times that of the conventional type counterbore. 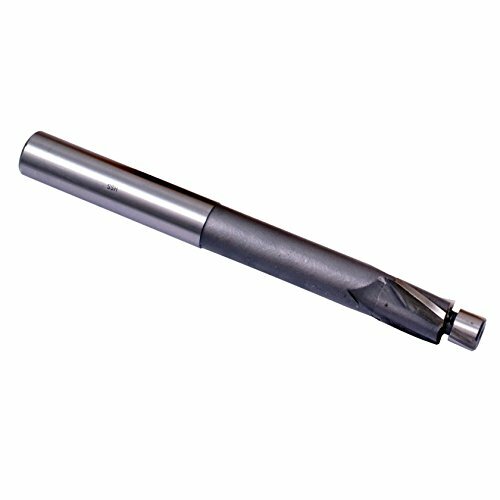 1/4 X 9/32" High Speed Steel 3 Flute Solid Pilot Counterbore ~ Cutter diameter is 13/32". ~ Shank diameter is 3/8". ~ Overall length is 3". ~ Continuous pilot counterbores cut rapidly, smoothly and accurately, producing long spiraling chips rather than small metal particles. ~ The pilot extends the full length of the flute portion of the tool. ~ As cutter flutes are ground back due to wear, a new section of pilot becomes exposed. ~ The pilot head may be cut off to any desired length when repeated sharpening makes it too long for practical use. ~ Continuous pilot counterbores have a life many times that of the conventional type counterbore. ~ Cap Screw is 1/4". ~ Pilot Diameter is 9/32". High Speed Steel. Interchangeable Pilot Type Straight Shank Counterbore. PLEASE NOTE: The photograph shows a Straight Shank Interchangeable Pilot Counterbore, but not necessarily this specific diameter or shank. 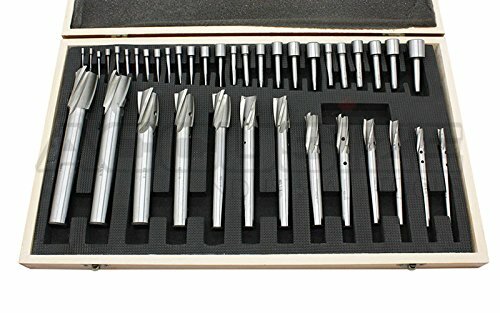 21 Piece High Speed Steel Interchangeable Pilot Counterbore Set ~ Supplied in a fitted case. ~ 14 pilots with a 5/32" shank including 0.187, 0.204, 0.213, 0.229, 1/4, 17/64, 9/32, 5/16, 21/64, 11/32, 3/8, 25/64, 13/32 and 7/16. ~ 6 counterbores including 5/16, 3/8, 7/16, 1/2, 9/16 and 5/8. ~ 1 Holder with a 3/8" shank. ~ Straight shank. For Metric Socket Head Cap Screws. Usually has 3 flutes, but may have 4 flutes . High speed steel, for metric socket cap screws. 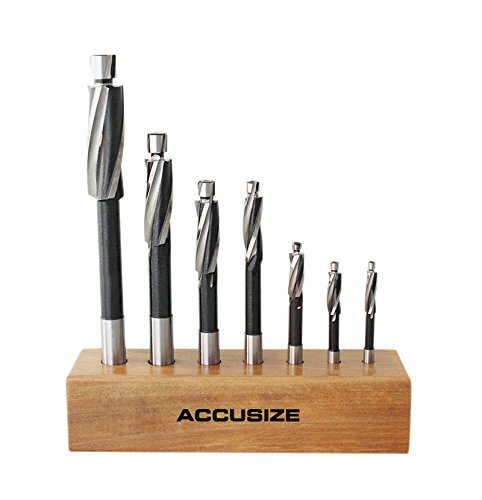 High Speed Steel Aircraft Type Counterbores, designed for aircraft fabrication use with portable pneumatic and electric drills. Smaller pilot holes than standard counterbores. Corner radius 1/32" is standard. 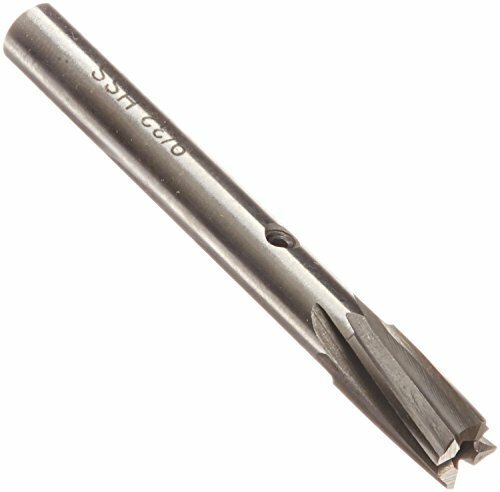 HHIP 3 Flute straight shank solid pilot counter bore is made of high speed steel. Cap screw is M10. Cutter diameter is 18.0mm. Shank diameter is 12.5mm. Overall length is 100mm. Pilot diameter is 11.0mm. Continuous pilot counter bores cut rapidly, smoothly and accurately, producing long spiraling chips rather than small metal particles. 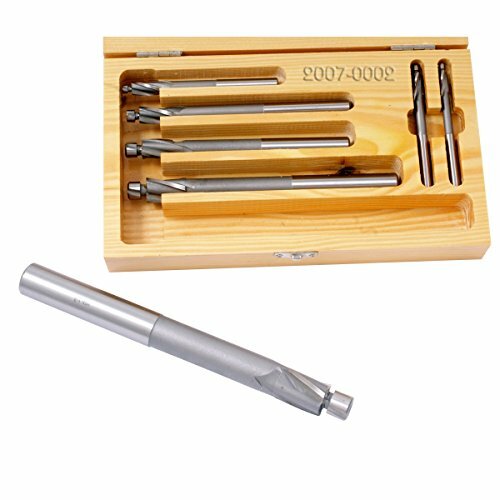 The pilot extends the full length of the flute portion of the tool. As cutter flutes are ground back due to wear, a new section of pilot becomes exposed. The pilot head may be cut off to any desired length when repeated sharpening makes it too long for practical use. Continuous pilot counter bores have a life many times that of the conventional type counter bore. Counterbore Size: 1/4''; Pilot Hole Size: 3/32"; Range of Pilot Sizes: 1/8"-3/16"; Shank for Counterbore:15/64"; Overall Length: 3-13/16" Counterbore Size: 5/16''; Pilot Hole Size: 3/32"; Range of Pilot Sizes: 1/8"-1/4"; Shank for Counterbore:19/64"; Overall Length: 3-13/16" Counterbore Size: 3/8''; Pilot Hole Size: 5/32"; Range of Pilot Sizes: 3/16''-5/16"; Shank for Counterbore:5/16"; Overall Length: 4-1/16" Counterbore Size: 7/16''; Pilot Hole Size: 5/32"; Range of Pilot Sizes: 3/16''-3/8"; Shank for Counterbore:3/8"; Overall Length: 4-1/16" Counterbore Size: 1/2''; Pilot Hole Size: 3/16"; Range of Pilot Sizes: 1/4-7/16"; Shank for Counterbore:7/16"; Overall Length: 4-5/16" Counterbore Size: 9/16''; Pilot Hole Size: 3/16"; Range of Pilot Sizes: 1/4"-1/2"; Shank for Counterbore:7/16"; Overall Length: 4-5/16" Counterbore Size: 5/8''; Pilot Hole Size: 3/16"; Range of Pilot Sizes: 1/4"-9/16"; Shank for Counterbore:1/2"; Overall Length: 5-1/8" Counterbore Size: 11/16''; Pilot Hole Size: 3/16"; Range of Pilot Sizes: 1/4"-5/8"; Shank for Counterbore:1/2"; Overall Length: 5-1/8" Counterbore Size: 3/4''; Pilot Hole Size: 1/4"; Range of Pilot Sizes: 5/16''-11/16''; Shank for Counterbore:1/2"; Overall Length: 5-3/8" Counterbore Size: 13/16''; Pilot Hole Size: 1/4"; Range of Pilot Sizes: 5/16''-3/4''; Shank for Counterbore:5/8"; Overall Length: 5-3/8" Counterbore Size: 7/8''; Pilot Hole Size: 1/4"; Range of Pilot Sizes: 5/16''-13/16''; Shank for Counterbore:3/4"; Overall Length: 5-3/8" Counterbore Size: 15/16''; Pilot Hole Size: 1/4"; Range of Pilot Sizes: 5/16''-7/8''; Shank for Counterbore:3/4"; Overall Length: 6-1/8" Counterbore Size: 1''; Pilot Hole Size: 5/16"; Range of Pilot Sizes: 3/8'-15/16''; Shank for Counterbore:3/4"; Overall Length: 6-3/8"
Continuous pilot counterbores cut rapidly, smoothly and accurately, producing long spiraling chips rather than small metal particles. Includes the #6, #8, #10, 1/4, 5/16, 3/8, & 1/2 sizes. The pilot extends the full length of the flute portion of the tool. As cutter flutes are ground back due to wear, a new section of pilot becomes exposed. The pilot head may be cut off to any desired length when repeated sharpening makes it too long for practical use. Continuous pilot counterbores have a life many times that of the conventional type counterbore.